This is a painting I did as a commemorative piece, which is something I rarely do. I almost always refuse to do commissioned work. 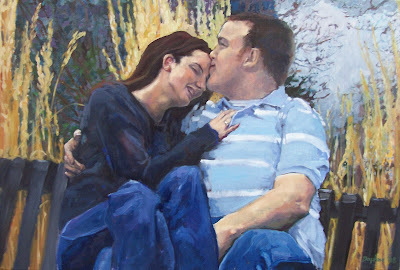 In this painting I tried to capture the emotional pull between this couple. He really can't keep his hands off her it is very heartwarming to see a couple so in love. I wasn't going to post it at first because I didn't want people to think that I would do commissioned pieces but when I showed it to my mother she cried, so I thought it must be good or she is hormonal. So, I am posting it. Throughout much of my University days I did mostly figurative work, so this is nothing new to me. I am putting this work out there so that it may raise some interest or some discussion between people.